Read for This Week's Study: Gen. 9:12-17, 17:2-12, Gal. 3:15-28, Deut. 9:9, Heb. 10:11-18, Heb. 9:15-28. Memory Text: For this reason Christ is the mediator of a new covenant, that those who are called may receive the promised eternal inheritance-now that he has died as a ransom to set them free from the sins committed under the first covenant (Hebrews 9:15, NIV). God's eternal decision to save humanity has been revealed to us through the ages in the covenants. Though the Bible speaks of covenants in the plural (Rom. 9:4, Gal. 4:24, Eph. 2:12), there is really only the covenant of grace, in which salvation is given to sinners, not on the basis of their merits but on the merits of Jesus that are offered to all who claim those merits by faith. The plural, covenants, simply means that God has advanced His saving purposes by restating the covenant in various ways in order to meet the needs of His people in different times and settings. It is always, though, one covenant-the eternal covenant of God's saving grace. The heart of this covenant is our Lord's steadfast, faithful love, a love that the Bible at times even equates with the covenants themselves (see Deut. 7:9, 1 Kings 8:23, Dan. 9:4). As part of that covenant, God calls His people to obey His law, not as a means of salvation but as the fruit of it. Law and grace together have always been central to God's eternal covenant. *Study this week's lesson to prepare for Sabbath, June 7. A covenant is usually sealed with at least one symbol. For instance, a person purchasing a home places several signatures on a mortgage agreement with a lending institution, which keeps the title deed for the property in trust until the full amount is paid. Or married people are issued a legal document of marriage by the state. The symbol itself is not the covenant but an indicator that a person is obligated to a covenant. Read Genesis 9:12-17 and 17:2-12. What is the difference between the symbol and the covenant in these cases? Also, what are the differences between these two covenants? In Genesis 9:9 God covenants with creation that He will never again destroy the earth with water. Whenever a rainbow appears in the sky, all are expected to remember God's promise. The same is true for the mark of circumcision, which was supposed to remind every Jewish male of His people's role in blessing the nations. One covenant was made with all humanity, the other specifically with the nation of Israel. Also, in the covenant made with humanity after the Flood, the people didn't have to do anything; the promise was just there, regardless of what the people did. This wasn't so with the second one, the one made with Israel; the people had to fulfill their part of the deal. Covenants are based on promises. In fact, it is possible to use the two terms interchangeably. Of course, when a covenant is made, it is expected that the person who makes the promise (covenant) has the ability to deliver what is promised (covenanted). In the Old Testament, some covenants were local and limited affairs (see, for instance, Gen. 31:43-54). The incident with Jacob and Laban demonstrates that covenants can be transactions made within and between societies. The monument at Mizpah was to serve as the sign of a treaty that would only apply to the two clans. When those to whom the treaty applied had died, the terms of the treaty would be irrelevant. Unlike this covenant made between humans, the covenants that Yahweh instituted with Noah and Abraham have everlasting implications. How does Galatians 3:15-28 help to explain the broader implications of the Abrahamic covenant? Throughout the Bible, God has made several universal covenants in which He makes promises that are relevant to all humanity. Recognizing that the entire earth had been affected by the Flood, Yahweh promised not to allow His creation to be devastated by water again. In the case with Abraham, God saw humanity's need for righteousness and so He promised to provide a blessing for all nations through Abraham's seed (Gen. 22:18). Though God made the Sinai covenant with a specific nation it also has universal significance. God was very clear that any foreigner could be a part of the chosen people (for example, Exod. 12:48-49), and Israel's mission was to be an evangelistic light to the world (Exod. 19:5-6). What is your own personal understanding of your covenantal relationship with God? That is, what has God promised you, and what has He asked of you in return for those promises? Although a covenant is based on promises, there are usually conditions to meet before the promises are fulfilled. The Abrahamic covenant involved the circumcision of all males who were either born to Abraham or his descendants. When Yahweh covenanted with Israel, He personally engraved the requirements for the relationship on tablets of stone (Deut. 9:8-11). These requirements, preserved in the Ten Commandments, were to form the basis of God's everlasting covenant with all humans. Because they detail certain terms of the covenant, the Ten Commandments are often termed the tablets of the covenant (Deut. 9:9, NKJV). The Ten Commandments are not intended to be an obstacle course designed to make life hard for those who have entered into the covenant with God; instead, as an expression of God's love, the commandments have been given for the benefit of those who have entered into a covenant relationship with their Lord. In what ways do Jeremiah 31:31-34 and Hebrews 10:11-18 uphold the everlasting nature of God's law in the New Covenant? Under the Old Covenant at Mount Sinai, the Israelites and those who joined the community were obligated to demonstrate faithfulness to the covenant by keeping the Ten Commandments. When they violated a commandment they were expected to offer an animal sacrifice if they wished to have their sins forgiven. Under the New Covenant at Mount Calvary, God's people are still obligated to keep the Ten Commandments. However, when they sin they don't have to offer continuous sacrifices, because Jesus is their full and complete sacrifice (Heb. 9:11-14). The New Covenant is so much better than the old because now, by faith, we claim the promises of forgiveness offered to us through the sacrifice of Jesus. There is hope for us only as we come under the Abrahamic covenant, which is the covenant of grace by faith in Christ Jesus. -Ellen G. White Comments, The SDA Bible Commentary, vol. 6, p. 1077. What does it mean to have God's law written in your heart? How does this differ from merely understanding God's law as a code of obedience? There were strong consequences for violating certain biblical covenants. Yahweh warned Abraham that any male who was not circumcised would be cut off from the chosen (Gen. 17:14), and a litany of curses was directed toward those who refused to abide by the terms of the Sinai covenant (Deut. 27:11-26). Ultimately, those who violated the terms of the covenant would be punished with death (Ezek. 18:4). The same is true for the New Covenant: those who refuse to keep God's law are also denied access to eternal life (Rom. 6:23). Read Hebrews 9:15-28. In what ways is the gospel revealed in these verses? Hebrews 9:15-28 repeats the gospel story as it proclaims the part that Christ plays in securing the promises for believers. Verse 15 points out that Jesus functions as the mediator of the New Covenant who, through His death, offers eternal life to those who otherwise would face eternal destruction. In verses 16 and 17 some Bible translations switch from discussing covenant and introduce the term will instead, even though the same Greek word is used. This brings in the whole idea of death, the death of Jesus for us. When viewed in that context, the passage reminds the believer that without Christ the covenant requires the death of each sinner. However, the sinner can be covered and then cleansed by Christ's shed blood and thus be among those who eagerly wait His return (Heb. 9:28, NKJV). Then we shall know that our own righteousness is indeed as filthy rags, and that the blood of Christ alone can cleanse us from the defilement of sin, and renew our hearts in His own likeness. -Ellen G. White, Steps to Christ, p. 29. God Himself, in the person of Jesus, bore in Himself the punishment for our sins in order to spare us that punishment, which we deserve. What does this tell us about the character of God, and why we can trust Him, no matter our circumstances? In many instances people can experience the promises of a covenant before all the terms are even met. For instance, a person purchasing a home has the opportunity to live in the home before it is paid for. Or a citizen enjoys the public services offered by the government before he has even started paying taxes. Those who enter into a covenant with God can also start to experience the benefits of the covenant before the promises are actualized in the future. Think, for instance, about the Ten Commandments, and how much pain and suffering people could avoid if they simply followed them. Who hasn't personally experienced the heartache that comes from the violation of these commandments? Even worse, the suffering that comes isn't always limited to the one who violates the law; often others, even those closest to the sinner, suffer, as well. According to these texts, what other benefits can we find, even now, through being in a covenant relationship with Jesus? Jesus uses very strong language in the Gospel of John when He reports that those who accept Him have already passed from death into life (John 5:24, NKJV). So confident is the believer in his or her salvation that although confined to this earth, he or she can claim to be sitting in heavenly places with Christ Jesus (Eph. 2:6). If someone were to ask you, What does it mean to be sitting with Jesus in heaven now (as Ephesians 2:6 says)? What would you answer, and why? Further Study: For more information on this week's topic, read Ellen G. White, The Covenant of Grace, pp. 131-137, in God's Amazing Grace. "This same covenant was renewed to Abraham in the promise, In thy seed shall all the nations of the earth be blessed. Gen. 22:18. This promise pointed to Christ. So Abraham understood it, and he trusted in Christ for the forgiveness of sins. It was this faith that was accounted unto him for righteousness. The covenant with Abraham also maintained the authority of God's law. . . .
"The Abrahamic covenant was ratified by the blood of Christ, and it is called the second, or new, covenant, because the blood by which it was sealed was shed after the blood of the first covenant. . . .
"The covenant of grace is not a new truth, for it existed in the mind of God from all eternity. This is why it is called the everlasting covenant. . . . There is hope for us only as we come under the Abrahamic covenant, which is the covenant of grace by faith in Christ Jesus. -Ellen G. White, The Faith I Live By, p. 75. What do Exodus 31:16 and Isaiah 56:4-6 suggest about the importance of the Sabbath to the covenant? See also Ezekiel 20 . It is often thought that the Old Covenant, the one established with Abraham, was a covenant of works, in contrast to the New Covenant, which is of grace. Why is this idea wrong? What Bible verses can you find that prove it was always a covenant of grace? Why must it always have been by grace and never by works? Though Ephesians 1 doesn't use the phrase, everlasting covenant, in what way does this phrase help us to understand why it has been called that? While sitting in class in his Papua New Guinea high school, young Willie Siso noticed that he was having difficulty hearing. A doctor told him he had an inflammation in his ear. But Willie's hearing continued to fail. Why is God allowing this? he wondered. As his hearing deteriorated, Willie began learning sign language. He graduated from a teacher's college and took a job teaching in a middle school. In addition to his regular class, he taught five hearing-impaired students of various ages. In 2011 Willie enrolled at Pacific Adventist University to study theology. While teaching hearing-impaired children in a nearby school, he met Noah, an assistant teacher who was an Adventist. Noah told Willie that he didn't attend church. "I can't understand what is being said, and there's no one to interpret for me," he said. Then Noah's face lit up. "Since you can still hear some, and you know sign language, let's form a ministry for the hearing impaired." Willie and Noah began visiting hearing-impaired Adventists and inviting them to meet for worship on the university campus. Willie can still hear enough to interpret for the group of grateful believers. The members welcomed the hearing-impaired believers and are helping with transportation to and from the campus outside the city. The group is growing and now includes 10 regular members plus visitors. When the church pastor invited Willie to preach for church, he agreed, signing his own sermon for his hearing-impaired friends who attended. The next month Willie invited Noah to preach and the hearing-impaired group to lead out in Sabbath School. Willie interpreted for the hearing congregation. "I have a burden for the hearing impaired," Willie says. "I'd like to upload sermons in Pidgin sign language so that the hearing impaired can watch and be blessed." Willie is teaching sign language to other students on the Pacific Adventist University campus so that they can help reach out to the hearing impaired. "Almost every pastor and most other workers come across hearing-impaired people in their ministries," he says. "If they can sign, they can minister to these people." Willie's ministry continues to grow as the hearing-impaired members visit different churches each Sabbath. "Now I realize that God is using my hearing disability to open a new ministry for others in southern Papua New Guinea. Jesus said, 'And this gospel of the kingdom will be preached in the whole world as a testimony to all nations' (Matthew 24:14, NIV). The hearing impaired are part of our world; they need to hear too. Our mission offerings support Pacific Adventist University, which serves students from Papua New Guinea and across the South Pacific Division. Thank you. 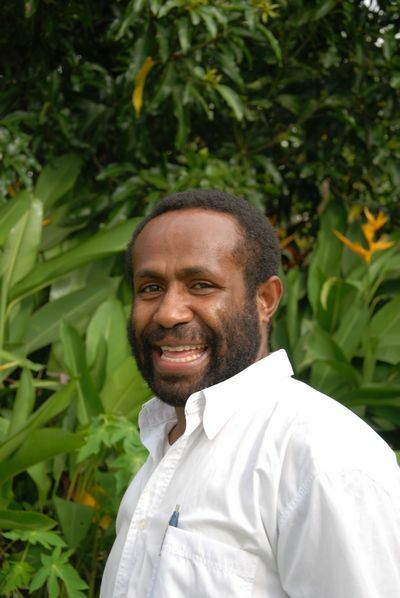 Willie Siso is a student at Pacific Adventist University in Papua New Guinea. He is preparing to serve God and the hearing impaired as a pastor.